We have raised quality standards and has certified the collector system. High demands on components and production methods. Higher quality - on your provider. Security for clients to work with P-labeled products. Demonstrate in major offers - projects. Using P-label for marketing purposes. Long-term ensure excellent GeoEnergy installations. MuoviTechs type-approved SC 1106-11 issued by Sitac - accredited by Swedac. Third party control performed by SP. 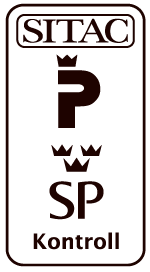 Testing and verification based on Certification rules SPCR 169 for P-Labelling of geothermal collectors issued by SP. EN, DS, and ISO standards. Based on the SP´s Certification Rules SPCR 169. SwedCert based on manufactures own rules corresponding fulfillment-manufacturing-testing. Example GEOTEC energy wells certificate 0296.